VALLE DE GUADALUPE - Baja's Valle de Guadalupe, just outside of Ensenada and 90 minutes from the border, has a history of farming and viticulture that dates back to the 16th century and the Spanish. In the early 20th century, Russian immigrants fleeing religious persecution from czarist Russia were granted farmland by the Mexican government where they planted vineyards as well. Wines from Baja now grace the menus of restaurants all over Mexico (we had our first bottle in Cuernavaca) and are becoming more available in the states. Recently, the region has garnered accolades for its wine, food and natural beauty from national publications The Wine Enthusiast and Conde Nast Traveler. To tour "The Valle", one steps into a time machine and is transported back to regional and cultural traditions, and then fast forwarded to new restaurants and vineyards that are working to propel and assure the region's future. Pours of the Rosé at Adobe Guadalupe. 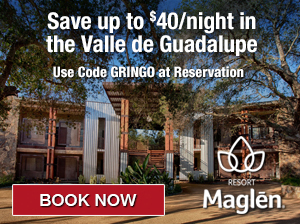 El Gringo has rolled through Valle de Guadalupe several times now, with each trip providing a different set of wineries, cuisine, people and experiences. The very first time was on an organized tour provided by the Los Rocas Resort in Rosarito Beach. My señorita and I found this to be a great introduction to the region, as well as a lot of fun experiencing it with others who were also new to the scene (in our case, a family of friendly visitors from Mexico City). Additionally, many of the Valle’s smaller boutique wineries require appointments for tastings. And a well-connected tour operator is key to getting past those large, beautiful and ornate wrought iron gates. 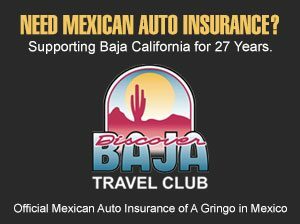 We’d been talking about conducting similar tours ourselves, and with friends in town from Colorado wanting to visit Baja, we seized the opportunity to arrange our inaugural “Escape to Baja Wine Country” outing. Putting out a last minute invitation to a handful of other friends, we quickly filled the 10 passenger van that would be provided by our guide and driver, Alain Preisser. We met Alain in Tijuana after a quick foot crossing over the border (parking our cars in an inexpensive lot on the US side in San Ysidro). On the itinerary: breakfast on the coast, followed by tours and tastings at three wineries (Tres Valles, Adobe Guadalupe and Vinos Malagon) and concluding with dinner at Javier Plascencia’s Valle de Guadalupe farm-to-table restaurant, Finca Altozano. Finca Altozano. Dinner with a view. Our first stop was just south of Rosarito Beach in La Mision for a “full breakfast” at Poco Cielo (Little Heaven). Poco Cielo is right next door to the famous La Fonda Hotel & Restaurant, and affords the same cliff top view of the majestic and blue Pacific Ocean. A “Little Heaven” indeed!. We enjoyed our coffees, drinks and breakfasts (El Gringo had a queso and chorizo omelet…delicioso!). In addition to the restaurant, Poco Cielo is also a hotel and offers affordable ocean view rooms (El Gringo will have to stay sometime and I’ll let you know how it is!). The tour starts with a full breakfast at Poco Cileo, a “Little Heaven” in La Mision. The view from Poco Cielo’s restaurant patio. It’s a beautiful day! After about 40 additional minutes on the road (90 minutes driving time total from the border at San Diego), we came over the mountains and dropped into Valle de Guadalupe. After recent rains, the typically semi arid region was beautifully painted with smatterings of light moss green across the valley and on the hillsides. Our first stop was at Tres Valles, one of the few wineries owned and operated by natives in nearby Ensenada. Established in 1999, the winery has several tasty reds and whites, most named in the indigenous Kiliwa language (i.e. KOJAA, which means “wine”). Additionally, the vineyards labels bear images of native animals, such as the lizard, spider and snake. Cool rebar and wine barrel animal sculptures are placed around the property as well, in an imaginative display of rustic artistry. Edmundo poured our tastings and provided an excellent commentary on the various blends we were trying. And speaking of blends, vineyards in Valle de Guadalupe are not shy about mixing their varietals. Some of the best blends found here combine grapes such as Cabernet, Tempranillo, Grenache, Syrah, Nebbiolo and many others. First stop for the tour: Ensenda’s own Tres Valles Vitivinicola. Tres Valles name their wines in the indigenous Kiliwa language. The varietals of Tres Valles. A giant spider looms in the background. Next up was Adobe Guadalupe, owned by Americans Don and Tru Miller. The couple built Adobe Guadalupe (a vineyard and six room B&B) after a vision Tru experienced in Notre Dame Cathedral after the passing of their son (who had an interest in Mexican viticulture). Today, the vineyard produces a number of excellent wines, all named after archangels in their son’s spirit. The Middle Eastern, open architecture of the vineyard buildings and the hotel take advantage of the open spaces and frame the valley’s landscape. The wines were hearty and inspired, and we enjoyed the grounds as well as the vineyard’s five amicable and very relaxed dogs. El Gringo’s señorita made a note to book us a room here sometime in the not too distant future. Welcome to Adobe Guadalupe, set on beautiful grounds. Enjoying the day, and the wine, at Adobe Guadalupe. The B&B courtyard at Adobe Guadalupe. Our final tasting of the day was at Vinos Malagon, a VERY early vineyard established in the early 1900s by expatriated Russians. When they say that one of their vines is considered an “old vine”, we believe it! In 2000, Jose Luis Malagon purchased the ranch and structured the current wine operations. The gloriously beaming and super friendly Anna Rosa poured our tastings and had arranged a platter of amazing cheeses and crackers for us to enjoy with their wines. Both wine and food were great, and we were treated to an unexpected surprise for a wine tasting…a sampling of their repasado tequila, Whistling Donkey (smooth, spicy and with a hint of vanilla. El Gringo brought one back for his 1 liter border allotment). Tour Guide Alain Preisser lines up a tasting of Vinos Malagon’s Whistling Donkey tequila. Our final stop was at Javier Plascencia’s Finca Altozano, a farm-to-table restaurant with comfortable outdoor seating atop a hill with a vast view of the Valle as your dining companion. It was a good thing that Alain had kept the restaurant current on our timing as we were running just a touch late (El Gringo was on Mexican Time). The restaurant was bustling and full of happy customers enjoying the food, wine, views and large wine barrels on the edge of the restaurant’s peripheral. These barrels have steps to the top and seats for friends to gather and enjoy the Valle views. Guests at Finca Altozano enjoy a little playfulness in the giant wine barrels on the property. The busy and friendly staff at Finca Altozano keep the good stuff flying. Finca Altozano provides a rustic outdoor setting and amazing food. We were seated at a very cool, long, rustic table with an excellent view of the Valle. We ordered beers and wines and contemplated the myriad food choices. Ultimately, Ursula and I ordered a surf and turf feast: Ahi Tostadas and Grilled Pulpo (octopus) representing for Surf, and Borrego (Lamb) de Rancho Cortes and Birria de Borrega fronting for Turf. There was no contest…it was ALL perfectly prepared, presented and enjoyed. El Gringo washed his food down with a Fune’s Blanco, the Tijuana-based craft brewer’s take on a Belgian Ale (very good, BTW). Surf. The super fresh Ahi Tostada at Finca Altozano. Turf. The Borrego (Lamb) de Rancho Cortes a la Caja China at Finca Altozano. Satiated, satisfied and sunkissed, we loaded up and pointed the van north back to the border. Overall, the day was a GREAT success, and we were happy to introduce a great group of friends to the Baja Wine Country. I love reading your posts! I attended a wonderful event last year at Baron Balche Winery and was wondering if you were interested in putting a group together to attend this year, and if so, Iâd love to go! Hi Jackie! Gracias for following El Gringo. We are hoping to do monthly yours starting in May. Join our mailing list for more information at: http://agringoinmexico.wordpress.com/contact-el-gringo. Let me know what that event was, and we can perhaps arrange a special tour for you and your group. You could certainly ssee your expertise iin the article you write. are not afraid to mention hoow they believe. Thanks for your comment, Jarrod. And thank you for reading and your compliments. It’s not very hard to write from the heart about Mexico. It’s an amazing country with so much about it that I love. El Gringo– you have an eye for detail and a passion that is wonderful to behold. Stumbled across your posts and thoroughly enjoying them. May your love affair stay undiminished. If you ever do tours please post on your blog. Thanks for your comment, Shahzad! I’m glad you enjoy my humble blog. It’s a labor of love, but gives me a great excuse to head south as often as possible! We do do tours of the Valle de Guadalupe on occasion, and are always available to book private tours of 6 or more. You can find out more at our other site, http://www.EscapeToBaja.com. Scott, the next time you’re in the Valle you should stop at Valley Girl Wines and meet the owner Sitara Monica Pervez. She makes some of the best wines you’ll ever have. Went with a friend who was the Executive Chef for Constellation Group in Napa for 10 years and has tasted a multitude of great wines. He loves Valley Girl wines and I think you would too! Happy travels,,,. Thanks for your comment, Larry! I’ve heard about the Valley Girl and LOVE the name! I think she may also run Valle tours. We will look Sitara up on one of our next trips down for sure.